This is a very interesting project with many practical applications in security and alarm systems for homes, shops and cars. It consists of a set of ultrasonic receiver and transmitter which operate at the same frequency. When something moves in the area covered by the circuit the circuit’s fine balance is disturbed and the alarm is triggered. The circuit is very sensitive and can be adjusted to reset itself automatically or to stay triggered till it is reset manually after an alarm. As it has already been stated the circuit consists of an ultrasonic transmitter and a receiver both of which work at the same frequency. They use ultrasonic piezoelectric transducers as output and input devices respectively and their frequency of operation is determined by the particular devices in use. that is reflected back to the receiver becomes distorted and the circuit is thrown out of balance. The output of IC2 changes abruptly and the Schmitt trigger circuit which is built around the remaining two gates in IC3 is triggered. This drives the output transistors TR1,2 which in turn give a signal to the alarm system or if there is a relay connected to the circuit, in series with the collector of TR1, it becomes activated. The circuit works from 9-12 VDC and can be used with batteries or a power supply. @Clean the component leads with a small piece of emery paper. @Bend them at the correct distance from the component’s body and insert the component in its place on the board. @You may find sometimes a component with heavier gauge leads than usual, that are too thick to enter in the holes of the p.c. board. @In this case use a mini drill to enlarge the holes slightly. Do not make the holes too large as this is going to make soldering difficult afterwards. @Take the hot iron and place its tip on the component lead while holding the end of the solder wire at the point where the lead emerges from the board. The iron tip must touch the lead slightly above the p.c. board. @When the solder starts to melt and flow wait till it covers evenly the area around the hole and the flux boils and gets out from underneath the solder. The whole operation should not take more than 5 seconds. Remove the iron and allow the solder to cool naturally without blowing on it or moving the component. If everything was done properly the surface of the joint must have a bright metallic finish and its edges should be smoothly ended on the component lead and the board track. If the solder looks dull, cracked,or has the shape of a blob then you have made a dry joint and you should remove the solder (with a pump, or a solder wick) and redo it. @Take care not to overheat the tracks as it is very easy to lift them from the board and break them. @When you are soldering a sensitive component it is good practice to hold the lead from the component side of the board with a pair of long-nose pliers to divert any heat that could possibly damage the component. @Make sure that you do not use more solder than it is necessary as you are running the risk of short-circuiting adjacent tracks on the board, especially if they are very close together. @When you finish your work cut off the excess of the component leads and clean the board thoroughly with a suitable solvent to remove all flux residues that may still remain on it. @There are quite a few components in the circuit and you should be careful to avoid mistakes that will be difficult to trace and repair afterwards. Solder first the pins and the IC sockets and then following if that is possible the parts list the resistors the trimmers and the capacitors paying particular attention to the correct orientation of the electrolytic. @Solder then the transistors and the diodes taking care not to overheat them during soldering. The transducers should be positioned in such a way as they do not affect each other directly because this will reduce the efficiency of the circuit. When you finish soldering, check your work to make sure that you have done everything properly, and then insert the IC’s in their sockets paying attention to their correct orientation and handling IC3 with great care as it is of the CMOS type and can be damaged quite easily by static discharges. Do not take it out of its aluminium foil wrapper till it is time to insert it in its socket, ground the board and your body to discharge static electricity and then insert the IC carefully in its socket. In the kit you will find a LED and a resistor of 560 — which will help you to make the necessary adjustments to the circuit. Connect the resistor in series with the LED and then connect them between point 9 of the circuit and the positive supply rail (point 1). Connect the power supply across points 1 (+) and 2 (-) of the p.c. board and put P1 at roughly its middle position. Turn then P2 slowly till the LED lights when you move your fingers slightly in front of the transducers. If you have a frequency counter then you can make a much more accurate adjustment of the circuit. Connect the frequency counter across the transducer and adjust P2 till the frequency of the oscillator is exactly the same as the resonant frequency of the transducer. Adjust then P1 for maximum sensitivity. Connecting together pins 7 & 8 on the p.c. 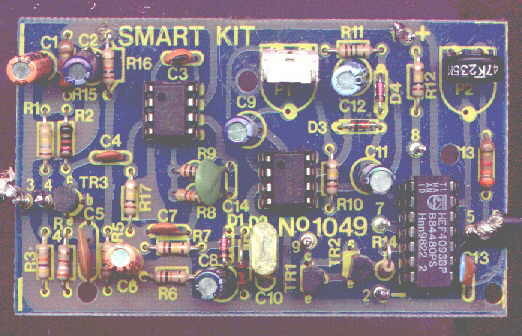 board will make the circuit to stay triggered till it is manually reset after an alarm. This can be very useful if you want to know that there was an attempt to enter in the place which are protected by the radar. This kit does not need any adjustments, if you follow the building instructions. Make sure that all the polarised components have been soldered the right way round. Make sure that the supply has the correct voltage and is connected the right way round to your circuit. Check your project for faulty or damaged components. UltraSonic Radar electronic circuit. Security and other sensors and detectors electronic circuits and schematics.